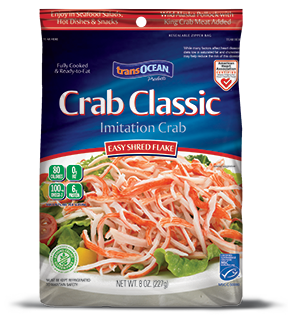 Crab Classic Shred Style has all of the delicious flavor of our other varieties and has been conveniently pre-shredded for easy use in your favorite recipes. Sprinkle the shredded crab onto a cold, green salad or add it to enchiladas, fish tacos or other hot dishes for great tasting seafood meals. Crab Classic is fat free, low in cholesterol and a source of Omega-3 EPA and DHA, providing 100mg per 3 oz. serving. Made from wild caught, MSC-certified Alaska Pollock and real King Crab Meat, Crab Classic is a heart healthy seafood choice.